Heat Butter in a pan, add cardamom,cinnamon,cloves, bay leaves, onion saute few mins. Add g.chilles carrot,beans, peas & saute few mins. Add soaked rice, mix it through & add milk with water & saffron . Allow to cook, until almost done. Add brocolli,red pepper,tomato & mix gently. Finish with fried onion & cilantro. Serve with any kind of Raithas. Like your new header - looks fresh. The saffron rice looks & sounds flavorful. me too.. like the look of your new blog. very bright and inviting. 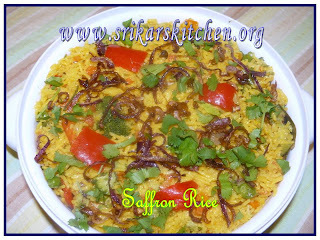 saffron rice looks yummy. Fresh green look :) Love the color of the rice! first of all..I love the new look of your blog..nice colours..
oh,thats a flavorful,rich rice sripriya! I love rice dishes like these. Looks special and appealing.. New blog looks cool..
Good template.. Love the rice too, looks very rich and colorful. delicious saffron rice! looks mouth-watering. New look of your blog is nice. I read a recipe for saffron rice yesterday - a sweet version. I would rather go in for your version - I am not a sweet rice person:). Looks inviting! 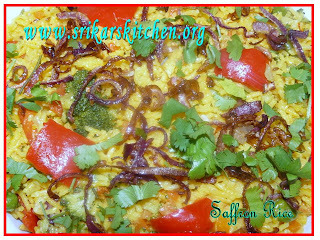 colorful template, colorful and yummy saffron rice too. Lovely ingredients - looks really yummy. Wow, looks very nice. Fried onions as garnish is always a winner idea.